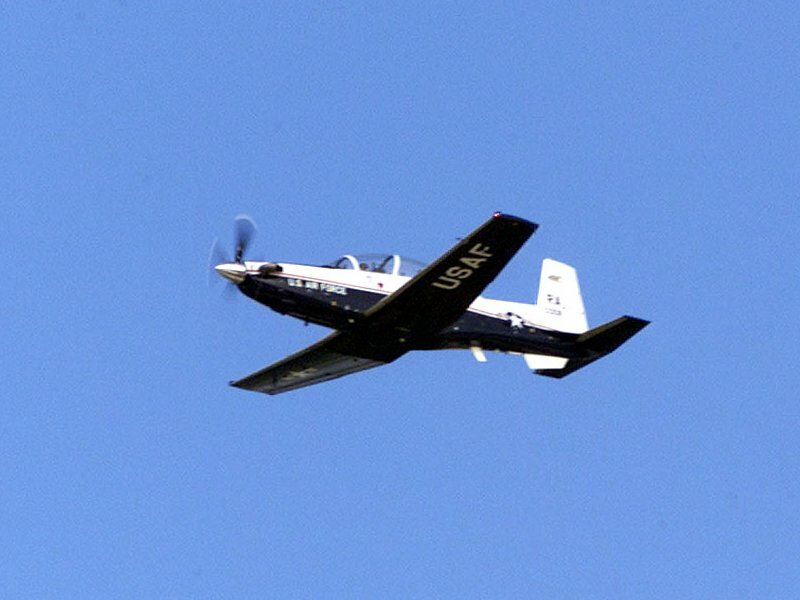 RANDOLPH AIR FORCE BASE, Texas (AFPN) -- Joint specialized undergraduate pilot training took on a new look here May 23 as the Air Force received the first operational T-6A Texan II. The T-6A is a joint-service primary pilot training aircraft that will replace the Air Force and Navy's aging fleets of primary trainers. Produced by Raytheon Aircraft Company, the T-6A will be used to train entry-level Air Force and Navy aviation students. "The T-6A is the trainer of the 21st Century," said Gen. Lloyd "Fig" Newton, commander of Air Education and Training Command, at the arrival ceremony. "The Navy and Air Force will once again fly a common aircraft with a common training system." Newton said he expects the T-6A to provide the Air Force and Navy with the same faithful service as the current training workhorses -- the T-37 Tweet and T-34 Turbomentor. He lauded the T-6A's high power-to-weight ratio, its modern cockpit, zero-zero ejection seat, ease of maintenance and low operating cost. "The T-6A will provide America with the best primary pilot training system in the world," said Newton. The chief of Naval Air Training, Rear Admiral Mike Bucchi, also participated in the arrival ceremony here. "Our country's security is dependent upon the competence and confidence of its warriors," said the admiral. "The T-6A training system is destined to enhance both ... I know, because I have flown it. I only wish I could begin my career all over again and have the opportunity to learn to fly in such a superb platform." The Air Force and Navy transition to the T-6A is expected to take approximately 10 years. The Air Force will steadily replace T-37s with T-6s at all Air Education and Training Command joint specialized undergraduate pilot training bases. Randolph's 559th Flying Training Squadron is the first operational unit to fly the T-6A. Moody Air Force Base, Ga., is next on the Air Force list, with the new trainer slated for arrival in late 2001. Laughlin AFB, and Sheppard AFB, Texas; Vance AFB, Okla.; and Columbus AFB, Miss., are also scheduled to transition to the T-6A for primary training. 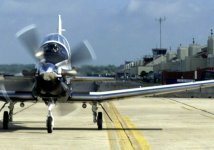 The Navy T-6As will be stationed at Naval Air Station Whiting Field and Naval Air Station Pensacola, Fla., and Naval Air Station Corpus Christi, Texas. According to training officials, the Air Force will receive 372 aircraft and the Navy will get 339 new trainers. An additional 29 T-6s will be used in the joint Air Force and Navy undergraduate navigator training program. Aircraft production at Raytheon is expected to last through 2014. T-6 program officials said the new trainer brings capabilities beyond those of the T-37 and T-34. It is also quieter and more fuel efficient. The T-6A can fly at speeds in excess of 270 knots true air speed. Its certified ceiling is 31,000 feet, and it has a range of more than 900 nautical miles. Because of its high thrust-to-weight ratio, the aircraft can perform an initial climb of 3,300 feet per minute and can reach 18,000 feet in less than six minutes. Its turbo-prop engine delivers 1,100 horsepower. The aircraft is fully aerobatic and has an anti-gravity system. Some other advantages of the T-6A over the T-37 are quicker handling and faster maintenance turnaround. The new trainer has an expected service life of approximately 16,000 flying hours.